All drawn points share the style and height property. Thus, changing the point style in one point object will automatically change the point style in other point objects, although they are not immediately and automatically redrawn. This is very different than other graphic primitives, where each has its own unique set of properties. Nevertheless, the points may have important uses so long as you keep in mind this limitation. Select Draw> Point from the main menu to open the Point dialog box. 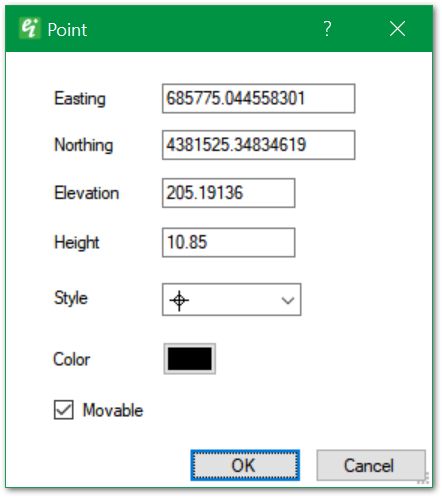 Edit the point properties as desired and click the OK button to save changes.